It's good to have an 'in' at Rockport. Right now they are offering big discount on over 150 pairs of their high-end shoes. However, if you add promo code EXTRA10 you'll get an additional 10% OFF and FREE shipping through May 20. Just choose your gender and shoe size and see what 'fits.' Everything from dress, pumps, casual, and exercise shoes (oh, and boots) are included. 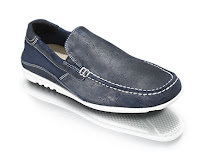 Click here to view the deals at Rockport. Add code EXTRA10 to get the additional savings and shipping.